When Jane Austen's nephew, James Edward Austen-Leigh, was amassing information for his Memoir published in 1870, the only portrait of her that could be found, in spite of diligent search among the family papers, was Cassandra's 'scribble', now NPG 3630. This was sent off to a Mr Andrews of Maidenhead who was instructed to make a copy from which a print could be engraved for the frontispiece. The copy is still in the family possession. The engraving met with a guarded reception from the family who wrote to Edward immediately after the Memoir appeared. Their letters have not been published but copies exist in the NPG archive. Cassandra's drawing, which judging from the sitter's age and dress, would seem to be of about 1810, is not mentioned in the letters between Jane and her sister, and the earliest comment appears to be Cassandra Elizabeth's in December 1869. It was first reproduced in Hubback's Jane Austen's Sailor Brothers, 1906, then in the possession of Miss Jane Austen, one of Admiral Charles Austen's three granddaughters who sold some of their property in about 1920 to a neighbour, a Cornish china merchant Frederick Lovering. At Lovering's death the drawing appeared at Sotheby's who drew it to the attention of Dr R. W. Chapman, then engaged in seeing his Clark Lectures through the Clarendon Press. Dr Chapman immediately told the NPG, Mr Percy Dobell was commissioned to bid at the sale on 3 May 1948 and, with help from the Friends of the National Libraries, the drawing was bought for the NPG. No-one claims much from Cassandra's drawing. Dr Chapman describes it as 'this disappointing scratch', and David Piper as 'the irrelevant painted doll's face in watercolours which her sister Cassandra began and gave up as a bad job: unfortunately she neglected to tear it up and now it must be preserved for ever to salve the consciences of historians' (D. Piper, Shades, 1970, p 51 and fig. 34). However, because of constant reproduction and lack of an alternative, this 'very pleasing sweet face' has become completely associated in our minds with Jane Austen herself. 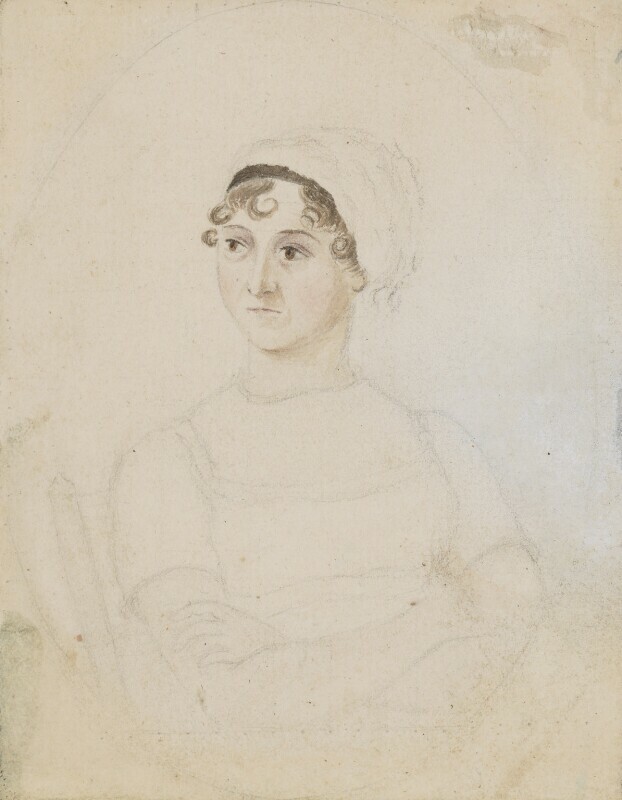 Half-length seated head turned to left, arms folded, in a pencilled oval; the face and neck lightly coloured, hair and eyebrows brown, eyes dark, arms and chair faintly coloured; bonnet white with brown lining, dress white; a bluish triangular area of watercolour to right of picture. Family possession descending to Miss Jane Austen, granddaughter of Admiral Charles Austen (Jane's brother); Frederick R. Lovering of St Austell; Sotheby's (Lovering sale) 3 May 1948 (265) bought by Percy Dobell for the NPG with help from the Friends of the National Libraries, 1948. '... I think the portrait is very much superior to anything that could have been expected from the sketch it was taken from - It is a very pleasing sweet face - tho' I confess to not thinking it much like the original - but that the public will not be able to detect ...' (letter from Cassandra Elizabeth Austen 18 December 1869, copy in NPG archive). '... there is a look which I recognise as hers - and though the general resemblance is not strong, yet as it represents a pleasing countenance it is so far a truth -' (letter from Caroline Austen (niece) not dated but probably shortly after publication of the Memoir, copy in NPG archive). '... how well the portrait has been lithographed! I think it very like only the eyes are too large, not for beauty but for likeness. I suppose making them so was Aunt Cassandra's tribute of affection ...' (letter from Elizabeth Rice (niece), 10 January 1870, copy in NPG archive).